Maddison was the nearly man again in Leicester’s next attack, when only the outstretched leg of the lunging Gomez blocked a goal-bound effort after he wriggled past Alexander-Arnold. Wes Morgan failed to sort his feet out from point-blank range after Marc Albrighton and Gray also missed contact from Ben Chilwell’s low centre. 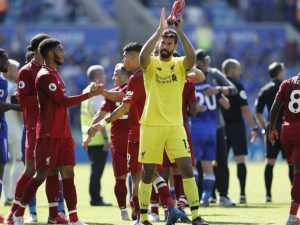 The changes made little effect however, although Leicester’s charge faded as Liverpool held firm in the closing stages.